With the change of the seasons I enjoy changing my cushion covers. It makes the house feel fresh (cause you get to clean them, ha!) and it gives the home a welcoming and new feel. However, with so many cushions around the house it can get expensive. And while I enjoy making my own covers like in this example, sometimes it helps to just buy them. Ya know, cause 3 kids can take up some serious time from your hands. I have come across 3 awesome (and even unlikely) places you might want to head next time you want to change things up. The best part is, all of them are under $10! 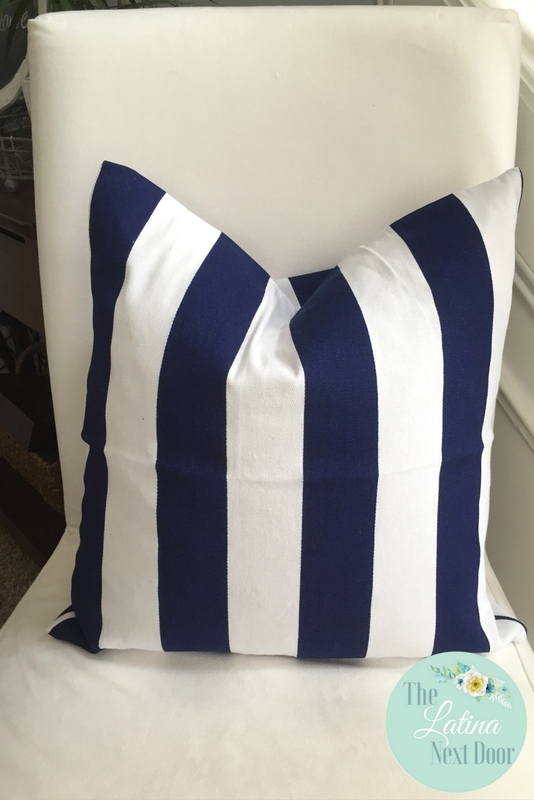 So sit back and relax while I show you where you can find cheap pillow cushions! I know it’s crazy sounding, but Amazon has some incredible deals when it comes to pillow covers. Who knew!? I got these cause I really wanted to see what type of quality they were. Here is what they look like up close. Their zipper is nicely hidden which is a PLUS! But it doesn’t go from end to end, so you’re going to have to smush your pillow quite a bit to get it in. I will note that you may have to reinforce the ends where the zipper begins and ends to prevent fraying. 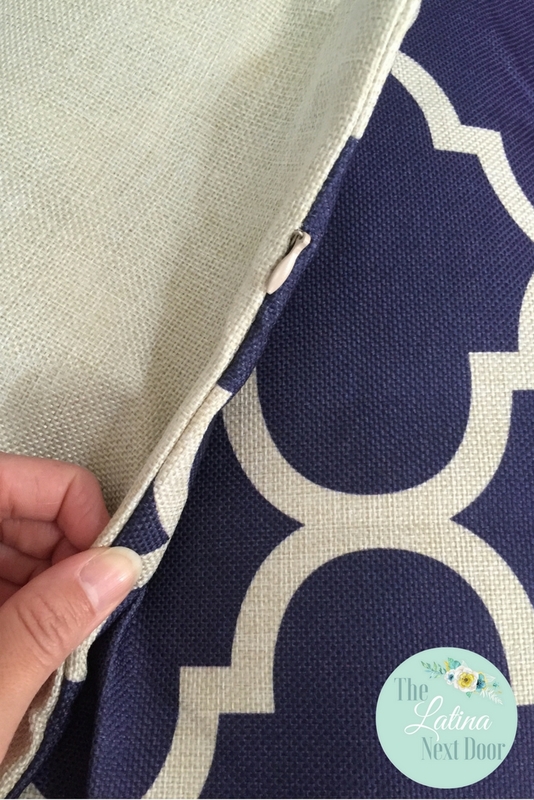 Other than that the fabric is pretty sturdy and the colors were true to the website’s image. They also went really well with the current decor I had going on. I really like the contrast between the navy and white and burlap with silver. I will say that I also ordered these at $4.75 but they were NOT true to the colors pictured. 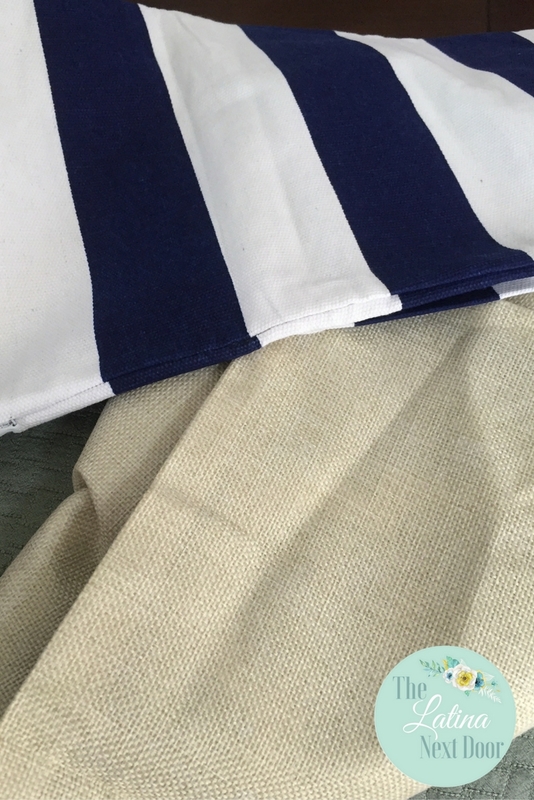 The quality and fabric were the same and the navy blue was perfect, but I was looking for a white, not a beige. 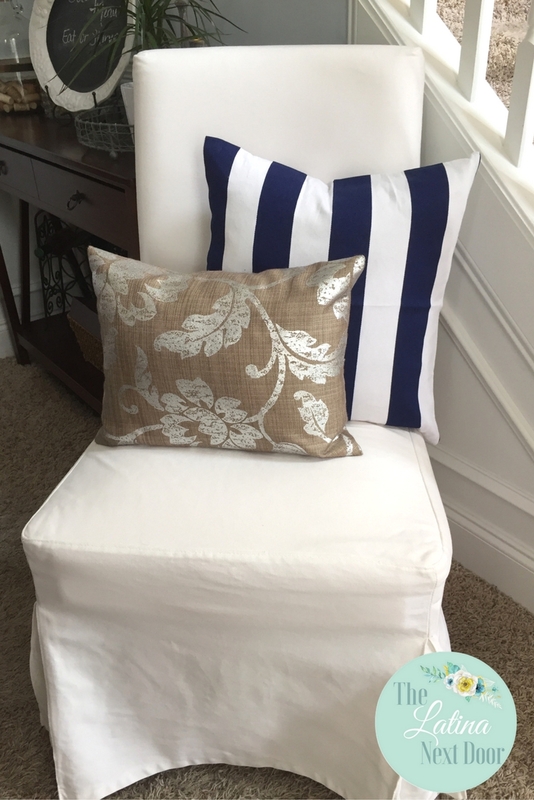 However the quality was still just as good as the striped one and I can still use them, since I use a lot of beige and burlap around the house (as you saw in the picture above), but this is the only thing to take note when ordering. The order also took a couple more days than the usual Amazon delivery time, but I wasn’t in a hurry so it was no big deal for me. However, if you are looking for a super affordable update for your cushions, Amazon is my first pick! Yes, you read that right. The clothing store. I would have never thought, but if you go to their online store, you can check out their home department and let me tell ya, it’s awesome! And even these for $4.99 (drool)! Those last ones totally go with my decor. They are of great quality too! They don’t always come with hidden zippers, but the fabric is sturdy yet soft and their zippers extend further than the ones from Amazon, making the less harder to stuff. This might seem like a no-brainer to some, but Etsy is a place for creators (mostly handmade) so you may think that prices might be a little higher than massed-produced places, but nope! As a matter of fact this will give you an endless amount of options because there is an abundance of fabrics like the ones you can find yourself at www.fabric.com only you don’t have to make them. Here are some options. While this one comes in at $9.35 (higher than the previous options, you will note the fabrics are stunning and more “designer” looking so the higher price justifies it. However, at under $10, these are still awesome-sauce!!! And they even have stylish options for the holidays, like this one right at $10.00. Is anyone else ready for the holidays?! I know my hubby and I are. He was even playing holiday music the other day while he was grilling. LOL! I am sure the neighbors thought we were nuts! So there you have them! 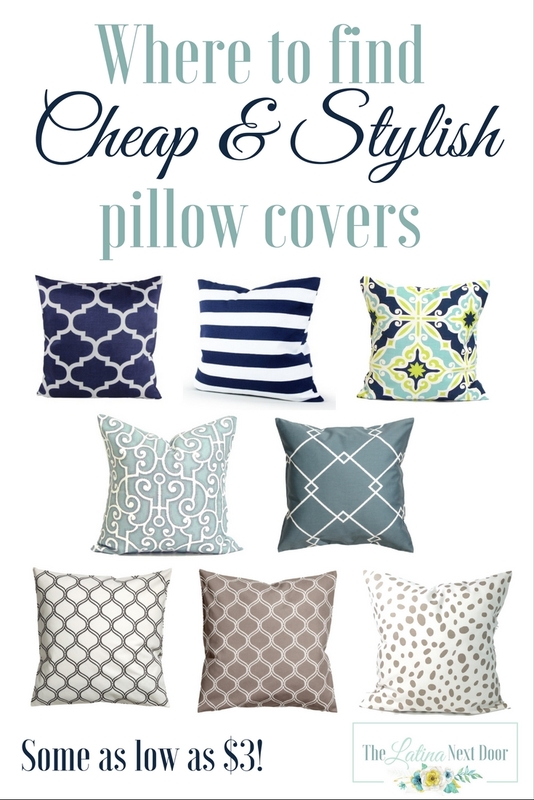 If you are looking for some great and super affordable options to change out those pillow covers (and finally wash them), you are welcome! If you know of any other great places, I would love to know in the comments below as well. P.S. Let’s connect on PINTEREST! These are awesome suggestions! I had no idea HM had home stuff! Who knew!? Thank you and yes! They have some trendy stuff for such great deals! I love visiting the site on a regular basis just to see what they have on sale for the home that month! I cannot believe these prices! I like to change my pillows out with my mood or change of season, but it gets pricey! I can’t wait to check these out! Thanks Brittany and yes, these are definitely great deals so you can change them out often. Those are some cute pillow options. Although I shop on Amazon all the time, I never thought to get pillow covers from them. Thanks! I didn’t either! I was do glad I found it though. My biggest surprise was H&M. Now I go to their site often just to check on items for the house.